This is not the kind of crackerjack we are talking about! Looking for a crackerjack chiropractor? Then you’ve come to the right place. You can get on page one of Google for all kinds of search terms, including crackerjack chiropractor. However, if prospective new patients, looking for a chiropractor, aren’t inclined to type crackerjack chiropractor into their favorite search engine, what’s the point? Since we work with chiropractors (crackerjack and others!) as well as other licensed professionals, we’ve learned a thing or two about how search engines work for new patient acquisition. May we put that knowledge to work for you and your practice? Naturally, many of the techniques we use were learned the old-fashioned way—making changes, waiting, monitoring the results and making still further changes. Rinse and repeat. We’re not about to surrender these hard-earned lessons. The key is to determine implicit searches from explicit searches. Speaking of rinse and repeat, imagine someone is searching online for shampoo. Don’t laugh. Over 130,000 people do. If you’re considering a chiropractic website for the new patients it can produce, it should be optimized for the most explicit new patient search terms. That is, terms that someone would actually type into their search engine because they’re ready to begin care. And we know what they are. Are You a Crackerjack Chiropractor? Now you know that anyone can get on page one of Google. 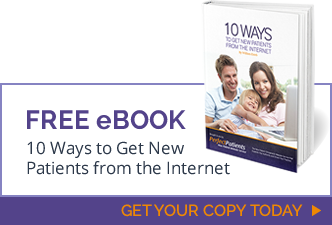 Which may or may not be helpful if what you really want is new patients. Thanks for allowing us to make this simple, but important point about search engine optimization. Compare our service plans, download our simple service agreement, and get started with Perfect Patients today!